FYI- Aldi sells 6ct English muffins for .99 each, (Walmart has 6ct for $1.78 and 12ct in the refrigerator section for $2.28), 18ct breakfast sausage for $4.99, a carton of eggs for .99 (or less), and 16ct slices of cheese for .99 (the recipe calls for 18 slices, but you can split a couple in half, or make a couple sandwiches without the cheese). 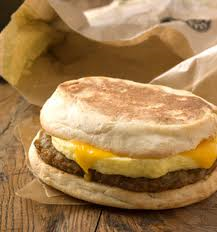 Total cost for groceries is about $9.95, which works out to .55 per breakfast sandwich. I checked Walmart the other day and 'ol Jimmy Dean wants $4.98 for 4ct of sausage, egg, and cheese biscuits ($1.24 each!). Let me do the math for you... these are WAY cheaper! Whip up the eggs with salt & pepper, mix in green onions. Pour onto baking sheet (I used a jelly roll pan) and bake at 350 until done (15-20min). While eggs are baking, toast English muffins, if desired. When eggs are cool, cut 3 rows lengthwise in the pan. Then cut 6 rows vertical making 18 egg squares. Assemble sandwiches by layering the bottom English muffin, sausage patty, egg square, slice of cheese, and top of English muffin. Wrap sandwiches in plastic wrap and foil. Then store in the English muffin bags in freezer until ready to eat. To serve, microwave 30-40 seconds on each side.